The Federal “Am I A Protected Veteran?” Poster assists applicants and employees of federal contractors in determining whether they are covered under VEVRAA. 11″ x 17″ – laminated both sides. The Federal Am I A Protected Veteran Poster provides category information to assist applicants and employees in determining whether their service and separation are covered under the Vietnam Era Veterans’ Readjustment Assistance Act (VEVRAA), which protects returning veterans from employment discrimination. Only service counted as “active duty” and a covered classification upon separation will qualify for VEVRAA protection. Every federal contractor with 50 or more employees and a contract of $100,000 or more for the procurement of personal property and non-personal services (including construction) is required to take affirmative action to recruit, hire, and promote covered veterans. Federal contractors are required to invite applicants to inform the contractor whether the applicant believes that he or she is a protected veteran who may be covered by the Act. 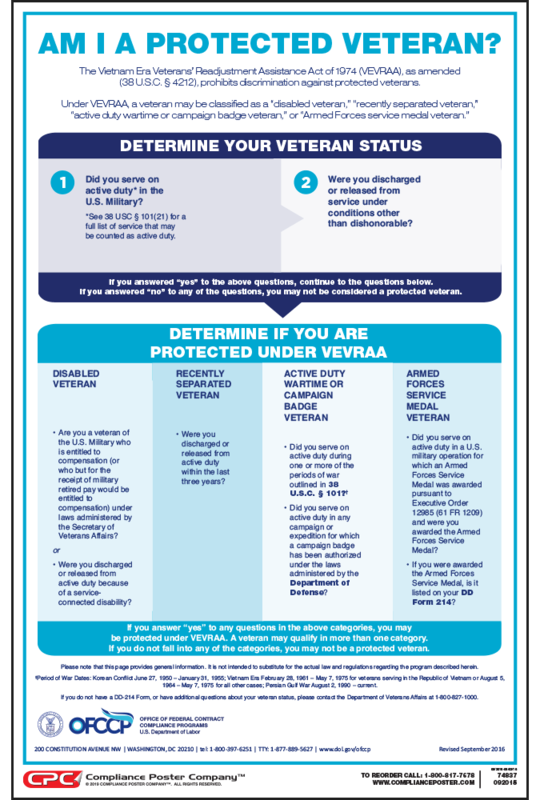 The Federal Am I a Protected Veteran Poster is not a mandatory posting, but can be used to supplement the VEVRAA affirmative action and equal employment requirements that federal contractors must operate under. The Office of Federal Contract Compliance Programs (OFCCP) protects the rights of employees and job applicants of federal contractors.